n an empty temporary doctor’s office of a temporary medical clinic, Nancy Neuman is holding the hand of a Mayan woman, who has carried a hernia for 10 years, explaining a procedure with an outcome that would be anything but temporary. Nancy is wearing plain grey nursing scrubs that contrast against her Spanish artisan jewelry. However, her beaded silver, wood and metallic stacked bracelets, with matching earrings and necklace, match up to her enthusiastic, colorful personality. The patient, Maria Pirir, stands with an unnatural hip thrust and tightens her face with even the smallest movement. Nancy sends a welcoming smile and a reassuring gesture, which for a moment looks as if Maria had forgotten about her pain. Past the shabby convenience stores, rocky street pavement and down a dirt pathway, is the San Raymundo medical clinic, which Refuge International occupies twice a year. Since the team last visited in October, many people have held off seeking medical attention until Refuge International came back in March. Often times they leave their village at 2 or 3 in the morning taking the bus, truck or walked three or four hours to get to the clinic. By 4 a.m., 50 people are here. Three hours later, 100 people are lined and given numbers. 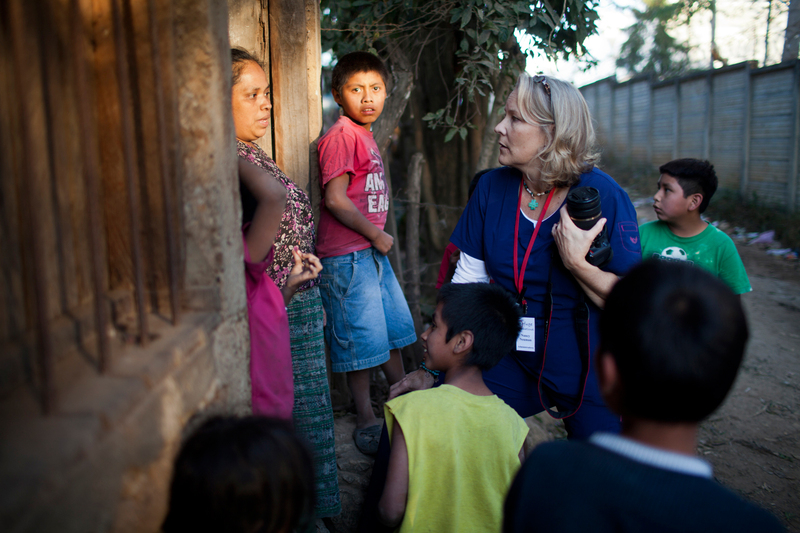 Since joining Refuge International in 2003, Nancy has played a key role at the San Raymundo clinic. Dr. Jordan Stanley, an orthopedic surgeon for Refuge International, described her as the “ship cruise director” as she begins planning a year in advance to round up medical volunteers, gathering supplies and making sure everything runs smoothly. But sometimes, things get out of hand. The doorman letting patients into the clinic comes to Nancy in a panic and tells her that there are four women outside yelling at him, claiming they arrived in the morning, but never received a number. “We can only see so many patients in a day,” she said. Normally, Nancy has a no excuses policy, but convinced the women were seconds away from having a ”throw down” with the doorman, she lets them in. 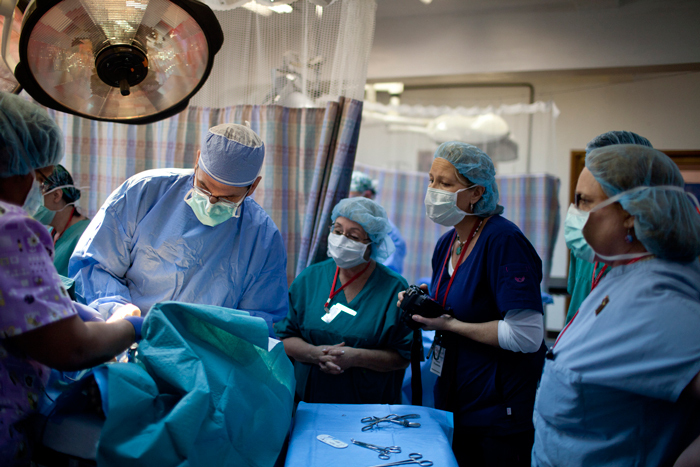 “Everyone deserves to see a doctor and have their basic needs met,” she said. Another job duty as Team Administrator is identifying what can be improved from the last medical mission trip. Since Refuge International does not advertise their trips and are funded by donations, they rely on word of mouth to reach out to volunteers. Although Refuge International stresses an importance in delivering quality care to each patient, numbers still matter. She notices a room, which isn’t being used, but occupied with boxes of supplies that will be used for the following week’s trip to the Sarstun clinic. She directs a medical examiner and translator to the room to start seeing more patients. Nancy is quickly called back to the pharmacy to translate to a patient. In fluent Spanish, she explains how to take the prescription drug to the patient. She fills the stereotype of the typical homemaker American mom with a put-together presence, a crafty sensibility and a darling family to complement her permanent happy glow. Past the sterling silver hooped earrings and vacation ranch in her hometown in Texas, is a woman who could easily give that all up and still retain her glow. “One of the major foundational precepts my parents taught me was to give back,” she said. And so she did, in a big way. Her first encounter to Latin America was back in high school when her father took a job in Costa Rica, where she lived for three years. “At the time, it was stable, but not a lot of money was there. A lot of poverty,” Nancy said, adding that’s the time when she became passionate about helping the culture get their basic needs. In 2000, she came back to Central America to the San Raymundo clinic. Nancy, a devoted Christian said they wanted to create a welcoming organization that was non-denominational. “No matter their religion—Christian, Buddhist, Hindu, Atheist—we wanted everyone to feel accepted and to use these facilities,” she said. The number of volunteers at the San Raymundo clinic has grown over the past years, with 55 volunteers including medical doctors, surgeons, translators, and for the first time, a dental team, all giving their time and money to join a bigger cause. Although Nancy has been going on missions since she was a teenage, she is “marveled” by the level of generosity and kindness in each volunteer. “I feel like I got a front row seat to the best drama being played out,” she said. Everyone brings their “A game” sacrificing a week’s worth of pay to work tirelessly for the benefit of other people. Refuge International’s volunteers come from various parts of the United States and share different religious backgrounds, but everyone shares a common goal: to make sure each patient walks out of the clinic happy and healthy. However, since the clinic does not have all the comprehensive tools and medication needed for each case, not everything pans out the way they want it. But sometimes good karma could help play a role during a crisis. Nancy recalled one her first mission trips where they saw a woman who was “dying and coming back to life” repeatedly. The cardiologist needed a specific type of medicine to fully revive her, which they didn’t have. The medicine was “a controlled substance” and not available in Guatemala. “We were working on the third bed farthest away from the entrance. Before we knew it, the vial of medicine gets passed from one bed to another.” The same medicine they were told they couldn’t get. She asked around the clinic wondering if anyone knew where the vial came from.